Thank you for being your guests for the best five days. We had a very pleasant time with great service at this magnificent place.Congratulations Wayne, to this house and your service minded team.We would like to return and be your guest again. Our stay exceeded our expectations in every way. Thanks to Henko, Cedric, Martha and all behind the scene staff. Beautiful position, stunning interiors and warm hospitality. What more could you ask for?! Our first time staying here, in fact our first visit to SA, but we will return hopefully! We came in to stay 1 night! The warm welcome and fantastic service overwhelmed us, so we stayed another night and finally added a third! A great place to be, its hard to leave! But now we have to. 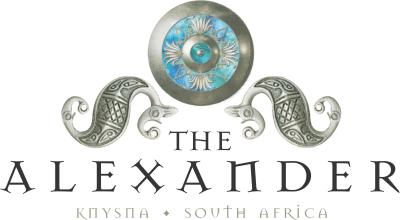 To our friends we said: We are going to see SA, we can’t go back and have only seen the “Alexander”. PS We will send all our friends to you! Thank you to all for an amazing stay at the Alexander. Truly a top notch experience from the moment you step through the front door. Without a doubt we will be back as soon as possible to this home away from home. P.S. A special thanks to Jas & Jess for adding something special to the experience. I think this has to be the best place I have ever been. Absolute stunning, perfect location & total class. The attention to detail is unbelievable!! We wish we could stay longer. Thank you for making our 1st wedding anniversary so special. 2010 We had a wonderful stay in your amazing guesthouse. Thank you for the great service, the lovely surroundings and cool ideas for self-decorating. Hope to come back. Thank you ver much. I found this place by accident – but it can only be described as a ‘happy’ accident as it was fantastic! The surroundings, friendliness, very high standards can only make it a must to return to. Thank you so much for making me feel so relaxed & welcomed. The help with my ongoing travels was also appreciated. I found this place by accident – but it can only be described as a ‘happy’ accident as it was fantastic! The surroundings, friendliness, very high standards can only make it a must to return to. Thank you so much for making me feel so relaxed & welcomed. The help with my ongoing travels was also appreciated. In knysna to celebrate our son’s wedding and spending the weekend at The Alexander made the few days complete Utopia on Earth. Thanks for going the extra mile. Thank you, Henko & Martha for excellent service! Such a beautifull place, stunning sea view, elegant interior design, of course, 5star smiles & Service! Definately will come back soon. And then there is something written in russian as well. Thanks for a wonderfull 3 days. The hospitality by all was excellent and the view fantastic. Many thanks to Cedric & Martha for the wonderfull service. Will remember this part of our trip with happy memories.